This is a healthier and sweeter alternative to fried white potatoes. But if you want to indulge occasionally, feel free to deep-fry these in organic, unrefined coconut oil until lightly browned, 3 to 4 minutes. Make the fries: Cut the potatoes into slices about ½-inch thick and then cut them ½ inch lengthwise into the shape of fries. 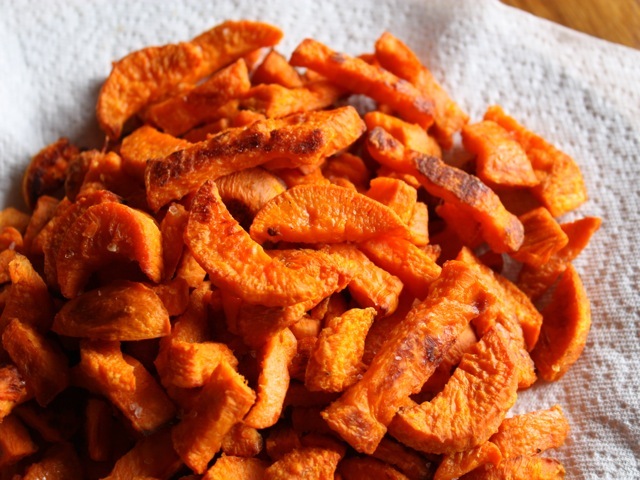 Combine the sweet potatoes, 3 quarts cold water, and 1 teaspoon salt in a large pot over high heat. Parboil, uncovered, for 10 minutes. Drain in a colander and pat well with a clean kitchen towel or paper towels until completely dry. In a large bowl, toss the sweet potatoes with the olive oil. Arrange the fries on a parchment-lined baking sheet and bake for 50 minutes, gently stirring every 15 minutes with a wooden spoon to ensure even browning, until tender and caramelized. Make the dipping sauce: In an upright blender, combine the ginger, peanuts, apple juice, agave nectar, cayenne, and salt, and blend until creamy. Transfer to a small bowl.